Audiobit Premium is a collection of commands and features that extend the capabilities of Audiobit Music Player. 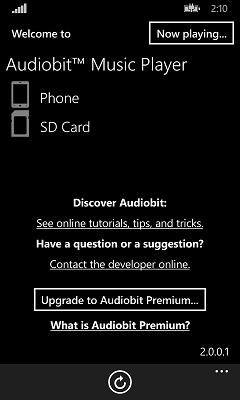 Unlike the basic Audiobit app, which is free, the Premium mode requires a subscription payment in order to be enabled. Can I try the Premium features before purchasing the subscription? Definitely: when you install Audiobit Music Player for the first time, the premium mode is enabled for a short time, letting you try all its advanced commands free of charge. When the trial ends, the premium features become disabled and you would need to purchase a Premium subscription to continue using the premium commands. What does the Premium subscription add to Audiobit? 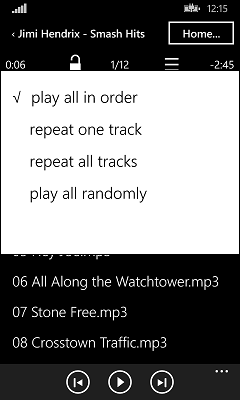 The Repeat One Track mode will play the currently selected track, over and over, until you select another track to play repeatedly. The Repeat All Tracks mode will play all the tracks in the current queue, and when the last track has been played, it will start playing the queue again, from the top. The Play All Randomly mode will play the tracks in the random order, jumping form one track to another in a random order. 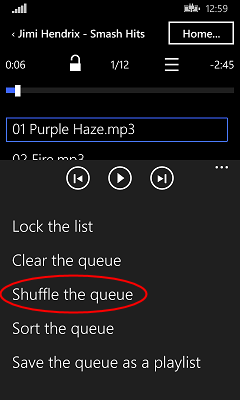 The order of all tracks in the current Now Playing queue would be randomized. If you don’t like the way they’ve been shuffled, choose the same command again, and the tracks will be shuffled more. To restore the alphabetical order of the playing queue, choose Sort the queue from the same menu. Note that if the folder you’ve pressed contains more than a handful tracks, it may take a few seconds before the prompt to add them appears on the screen. 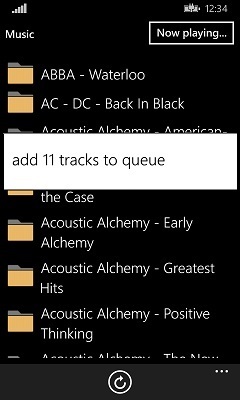 You can also add to the queue not just the whole folders but individual tracks, as well, in same way. The remove command will not delete the track from the phone, it will just remove it from the queue. If you change your mind, you can add it to the queue again later. 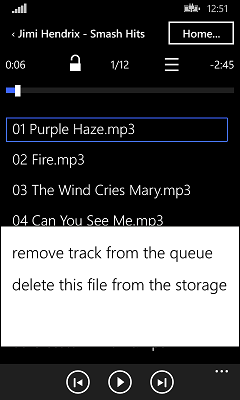 You also have the option to delete the track from the storage completely, by deleting its file. (You will be prompted to confirm this action, to make sure you did not select it accidentally.) 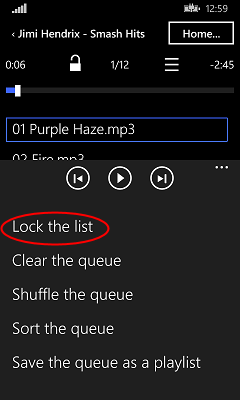 Note that if you delete the file from the storage, you will not see this file in the file listings anymore, and you would not be able to play that track later. 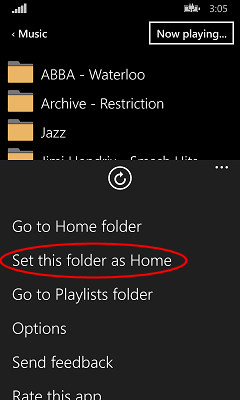 If you don’t want to lose this file forever, make sure you have another copy of it on your computer, before deleting it from the phone! Finally, press the Save button, and the current playing queue will be saved as a playlist file into the phone storage or on the SD card. 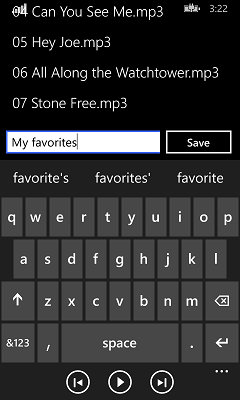 To play the playlist later on, navigate to the Music – Playlists folder, and tap the playlist name. See the little image of the lock on the screen? If you find yourself accidentally tapping on the tracks in the playing list while handling the phone and thus changing the tracks for no reason, you can tap the lock icon and that would lock the list. You could still scroll the list, and use the play, pause, next, and previous buttons at the bottom of the screen, but tapping on a track in the list would no longer cause it to start playing. To unlock the list, just tap the lock image again. Do I have to purchase the Premium subscription? No, you don’t have to purchase it: if you don’t need all the additional commands it gives you, you can continue using the player for the basic music playing, as before, no purchase is necessary for that. How do I purchase the Premium subscription?